In 1946, Harry Chamberlin was playing around with a tape recorder when he got a fabulous idea. He thought, “if I can make a recording of myself playing, why not build a machine that plays recordings” of various instruments. Harry’s idea was truly the first sampler in recording history. Harry’s first machine was a 100 Rhythmate. 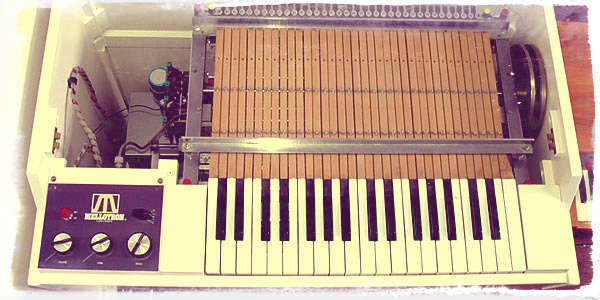 It had 14 looped drum patterns and was very similar to what the Optigan became. After some moderate success, he built the Model 200 keyboard. It used 1″ tape. Many other models were built with 35 keys. He could load various rhythm tapes, sound tapes and even sound effect tapes. His new instrument was awesome! Unfortunately Harry’s machines kept having problems breaking down. Long story short, he sold his rights to the Bradley family. Making the tapes took a ton of work. There was no digital editing software. The instruments had to be perfectly in tune and the tape splicing was an arduous process. Several models were made in the late 60s, but it was a very expensive unit. Fortunately many big stars were using the Mellotron. Artists like the Beatles, the Rolling Stones and other acts had listeners scratching their heads, wondering what was that cool new sound. How expensive was it? About $5,000 (which is about $35,000 in today’s money)! Between 1970-1980, about 250 units were built. In my opinion, these are the best ones to purchase. The 1973 M400 model is top notch. Some people, like me, can’t leave the house without taking my Mellotron with me. That’s why I made a bunch of Mellotron apps for Android. Follow the links below and you can have one too. excellent website and gives great information.